It’s one of fishing’s most common questions – what’s the best choice: real bait or artificial lures? In reality, there’s no one-size-fits-all answer to this timeless dilemma. Each approach to catching fish has its particular strengths and weaknesses, and each one is better suited to different conditions, environments, target species, and levels of angler competence. Let’s look at the pros and cons of real bait versus counterfeit offerings! Looking at fishing magazines, books, videos, and TV shows, it’s easy to assume that lure fishing is the dominant style of recreational angling around the world. Certainly, lure fishing receives the lion’s share of media coverage. However, this perception is far from reality. Day in and day out, many more fishers use natural baits than artificial lures. The angling media’s heavy bias toward lure and fly fishing is a clear reflection of the personal preferences of most writers and presenters, not to mention a tacit acknowledgement of the lure and fly fishing’s tendency to generate far more in the way of advertising revenue than “humble” bait fishing. There’s also a widely held belief that obtaining fishing “wisdom” follows an upward evolutionary trajectory, in which many beginners start out with bait, moving on to lures and perhaps even flies later in their angling careers as their skill levels grow.Implicit in this picture is an almost inevitable value judgement concerning the relative worth or merit of each fishing style. Under angling’s informal but historically entrenched hierarchical class system, fly fishing is typically seen as the pinnacle of the sport and as somewhat superior to lure fishing, with bait fishing languishing at the bottom of the pile. In Great Britain, this angling snobbery is further reinforced via the use of value-laden descriptions such as “game” and “coarse” fishing to describe different disciplines. In reality, there’s nothing to be gained from imposing such an archaic class system on the world of fishing. Each style of angling has its strengths and weaknesses, and expertise in any form requires dedication and skill. We should celebrate them all! Having said that, there’s no question that the very best, most consistently successful anglers are almost always those who cut their fishing teeth using natural baits. Bait fishing teaches new chums the absolute basics of the sport, including what food items fish prefer to eat, where fish expect to find those food items, and how and when fish prey upon them. Whether you remain a dedicated bait fisher for life or go on to try lures or even fly fishing, understanding these fundamental basics of the sport will stand you in great stead. Better still, finding, gathering, or catching your own bait rather than buying it from a shop magnifies all these important lessons. Bait collecting teaches an angler a great deal about where the food items fish prey upon live, how they behave, and what they look like. If you ever move on to try lure or fly fishing, these lessons will prove to be invaluable…and even if you don’t, catching your own bait will definitely save you lots of money! In many ways, fishing with lures is akin to hunting, while bait fishing is more like trapping. In other words, the bait fisher sets out his or her “traps” (baited hooks) and waits for the prey to stumble upon them. In contrast, a lure fisher can cover more water in less time. Like a hunter using a rifle or bow, the lure caster or troller actively seeks out the prey, and his or her lures are effectively bullets and arrows. Clearly, these two subtly different approaches will have varying levels of appeal for different anglers and comparative strengths and weaknesses under changing conditions. There’s no overall “best” method, simply better choices on the day. When catching a meal is absolutely paramount! Bait is extremely effective at fooling most fish. Bait is usually cheap (free if you catch your own!). You can cast out a bait, set your rod down, and wait for the fish to come to you! Leftover bait can be returned to its natural environment or taken home and frozen for future use. Many fish hook themselves when they eat bait; thus, knowing exactly when to strike is less critical. Bait appeals to an extraordinary range of fish species in most aquatic environments, and you will nearly always catch something on bait! Most bait needs refrigeration or a water-circulating live well to maintain freshness. 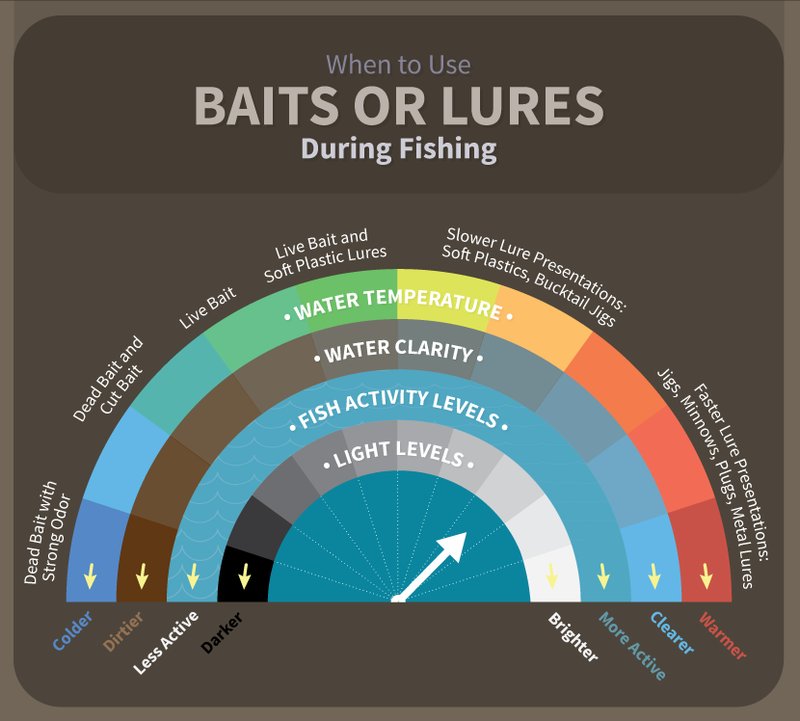 Finding and catching bait can be a dirty, difficult, and even potentially hazardous task. Most bait smells! Your hands, clothes, and gear will also become smelly when you go bait fishing. Bait is non-discriminatory; it often attracts under-sized fish and non-target species. Bait fishing is less spontaneous, and it usually requires at least some planning. Using bait often results in deeply hooked fish that can’t be easily released with a high chance of survival. Lures are simply fun to use! Catching a fish on a lure always seems especially satisfying. Lure fishing is an active, engaging pursuit, and you can cover a lot more water with a lure. Lures tend to catch slightly larger fish on average and attract less unwanted by-catch. Lures nearly always hook fish in the jaws, lips, or mouth, facilitating easier, safer catch and release. Lure collecting can become at least as addictive (and pleasurable) as lure fishing! Most good lures are expensive, and some are very expensive! Many lures are easily snagged on obstacles such as rocks, trees, or strands of water weed. Lure fishing demands constant motion, such casting and retrieving or trolling from a moving boat. Many species of fish are much less responsive to lures than they are to bait. Lure fishing generally demands better-quality tackle and a higher degree of skill than bait fishing. Lure collecting can become at least as addictive (and expensive) as lure fishing! In the final analysis, there can be no overall winner in the bait-versus-lures contest. Each approach has its strengths and weaknesses, and each will dominate under certain conditions or on a particular day. Smart (and successful) anglers will strive to be adept at both forms of fishing!